Find out the best hotels in Fuerteventura. From this page you might check the best hotels in Fuerteventura an island known for its quietness and warmness, from which the extensive and exotic beaches of fine golden sand and crystal clear waters stand out. As understandable, each person has its requirement and totally different needs. For this reason we invite you to discover the apartments and hotels in Fuerteventura, perfect for your stay and considering your needs and expectations. This way we inform you that through here you might access best last minute offers for hotels in Fuerteventura whether you’re coming for business or pleasure. To easily find the availability of different hotels in Fuerteventura we advise you to previously select the dates of your trips and the arranging order you prefer. Click on each apartment or hotel for more details. You might also find more photographs or opinions. 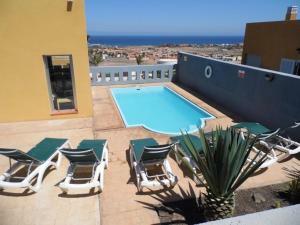 Featuring a sun terrace and private outdoor pool, Villa Buenas Vistas is set 2 km from Fuerteventura's Castillo Beach. The villa includes a barbecue and outdoor furniture. A 5-minute drive from the centre of Caleta de Fuste and 2.6 km from the beach, Vista Alta features barbecue facilities and an outdoor pool with sun loungers.